Wind is the New Hills! – Run. Ride. Roam. Wind is the New Hills! Phew! It was another tough one today! 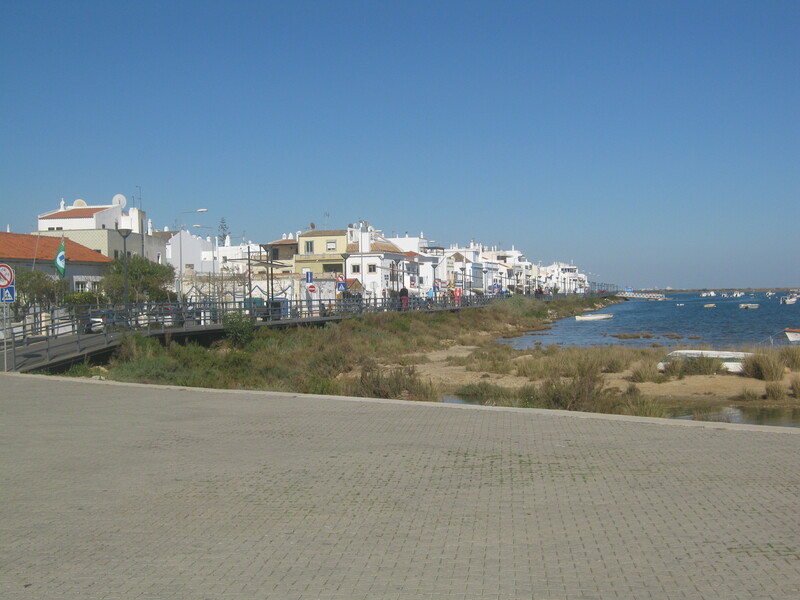 We left Faro fairly early and set off into the wind, and boy was there wind! We had an awful headwind the whole way and we were on a busy road most of the way too. I was in low gears and pushing with every ounce of strength I had, just to keep moving on the flat. I couldn’t keep up with Steve today. He was ahead and I guess his extra bit of weight and size helped him make some better headway into the wind, but it was giving me an absolute flogging. I’m just thankful that we didn’t have many hills today and the ones we did have weren’t too long or too steep. I knew I wouldn’t stand a chance against this headwind going uphill, because I was already using low gears on the flat, so the bike wouldn’t have had much left to give me, to make things any easier going uphill. So at least the hills were relatively kind and I just had to slog it out against that fierce headwind. 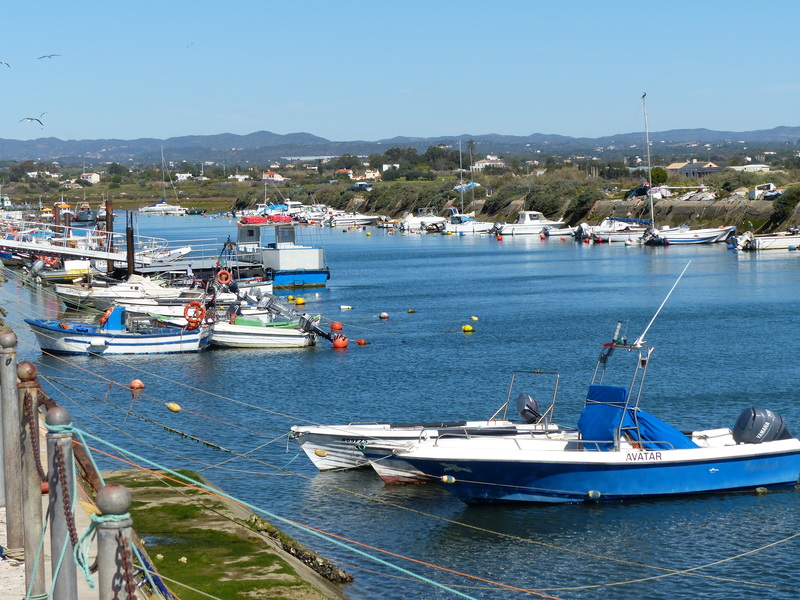 We rode into Olhao, which wasn’t far from Faro and it was a nice coastal town. 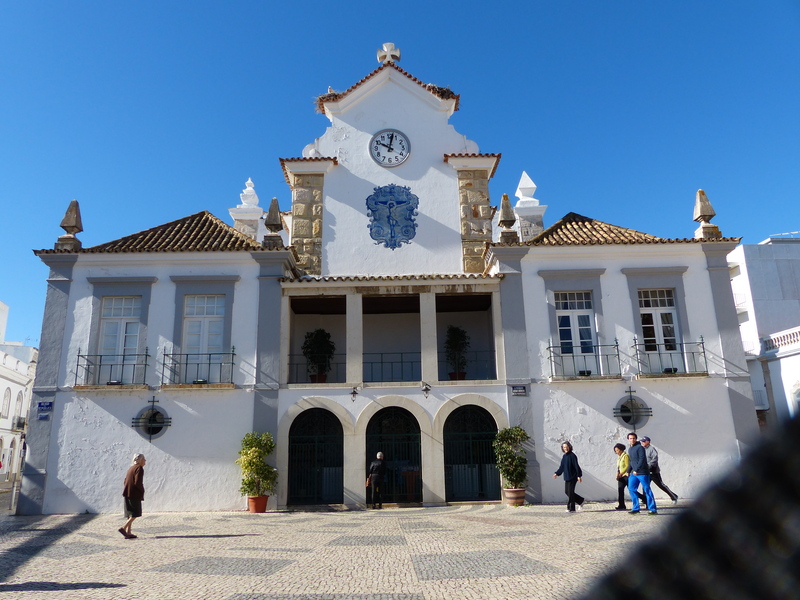 We stopped near a church in the square to take a photo and I went off to walk around to the front of the church to take a photo from there. As I walked around the side of the building, there were some women walking towards me, so I stepped off the narrow path to let them pass, then some more women came along. When I got to the other side of the church and stopped to take the photo, I noticed the same women walking past the church. Well, it seemed I had come across the Olhao Walkers! There were groups of women doing laps around and around the church, with smiles on their faces and having a chat and they were setting a pretty cracking pace. Of course, I had found myself going against the flow of traffic once again and had to use my boot scootin’ manoeuvres to avoid the oncoming tide of velour tracksuits! That sea of mauve and navy velour was a fast-flowing tide and woe betide any unsuspecting tourist that accidentally put a toe in that current, you would be swept away in a torrent of trackies! We took a few extra detours to have a break from the main road and rode into some really nice little coastal towns and villages. There were people out on the mudflats digging for clams, fisherman bringing in their catch and people just sitting and taking in the day. Then on we went and stopped for elevenses. Today elevenses marked a special occasion…we had hit a milestone…our 500th kilometre! Yep, we’ve done 500km in about 11 days of full riding. How about that! I should also mention that I’m doing all these kilometres unpadded. Steve wears padded bike shorts under his trousers and I wore padded shorts a couple of times, but they’re so uncomfortable and I’ve never been able to find a pair to fit me properly so they end up feeling all saggy baggy, so I ride unpadded with just backside on bike seat! So far it’s going OK! As we were riding along the main road we also saw our first other touring cyclist! He was on the other side of the four lanes of traffic but we exchanged big smiles and rapid waves. He had loaded panniers too and looked to be a young fella in his thirties with a really long beard. That either meant he was just a happenin’ modern guy of the new hirsute variety, or he had been on that bike for a really long time! The other thing we saw on that busy road was a family in their open horse-drawn wagon. Dad was at the reins, mum was nursing a baby, with both of them all wrapped up in shawls and blankets and there were two other small children in the wagon. Another time and place and they could have been the Ingalls family in their wagon on the prairies. All the traffic was zipping past and that horse, fully geared up with yoke and harness, just kept trotting along, with the family sitting in the back. A while later we passed another one, an open two-wheeled horse drawn wagon, with a man at the reins and another sitting in the wagon. Their transport certainly stood out and those horses were fantastic to pay no heed to the noise and smells and movement going on around them. On we went and that wind was brutal! There were times I couldn’t see where I was going because I just had to put my head down, to try and force myself into it and it was determined to stop me making any forward progress. I could do nothing but just push those pedals as hard as I could, even if they weren’t moving very fast. As we were turning down a road, there was a man standing on the corner with his dog and he saw me coming and held his hand up side-on and waved in back and forth, as if to gesture that I was being blown around, back and forth by the wind. I just laughed and nodded, because his observation was 100% accurate! Further along, there were some people on the other side of the road and one of the men stopped and looked at me going past and waved his arm back and forth in the direction the wind was blowing, as if to recognise that the wind was blowing strong and straight into me. Again I just smiled and nodded, because with Hercule Poirot accuracy, he too had made a correct and very accurate observation of the facts! 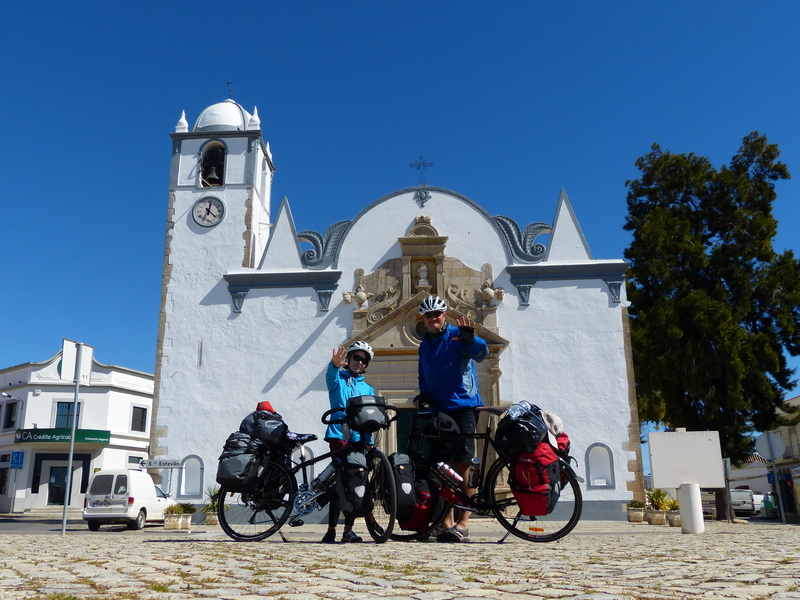 We eventually pedalled into Tavira, our pitstop for this leg of the journey and our next campsite. It was here, while I was waiting for Steve to check us in, that I had the most delightful encounter…! As I was waiting, a couple walked towards me, the woman stopped to talk to someone in a German accent and the man waited, holding a dog. I smiled and said hello and he looked at me and looked at the bikes. When the woman caught up to him after her chat, they walked past me and the dog dragged on its lead to come and investigate me. The man pulled it back, but I said, “Oh no, I don’t mind saying hello. I miss my own dog from home, so any time I can pat a dog I’m happy.” Then I gave the dog a pat and a ruffle. “We’re from Tasmania in Australia,” I said, always wanting to declare our allegiance to the little island state. Well, she was jumping up and down, so excited to hear we were from there! While she was jumping excitedly, her husband said he had noticed the brand on our panniers, Ortleib, and said they were from a place near their home town in Germany. “How long are you travelling?” they asked. “For the rest of the year,” I said. “Are you doing all your travelling on the bikes?” they asked. When I said we were, the man gave a thumbs up and said good-luck. So all from me giving a dog a pat, I met Gerdi Linke from Bavaria and her husband and what an absolutely delightful meeting it was too! It was another beautiful warm day, so after pitching the tent and having a quick bite to eat, we set off for a short roam through the town. This is such a lovely place! We wandered down to the water and strolled along the most beautiful and quaint little street, with the boardwalk running alongside the water and lining the cobbled street were all the eateries, with people sitting out in the sunshine. We decided that looked pretty good, so we headed for a cafe and Steve had a beer and I had a tonic water with ice and a slice and we sat in that beautiful sun and put all memories of the gruelling battle on the road behind us. I’ve mentioned before how cheap things are here, well Steve’s beer and my tonic water came to a grand total of 2.50! 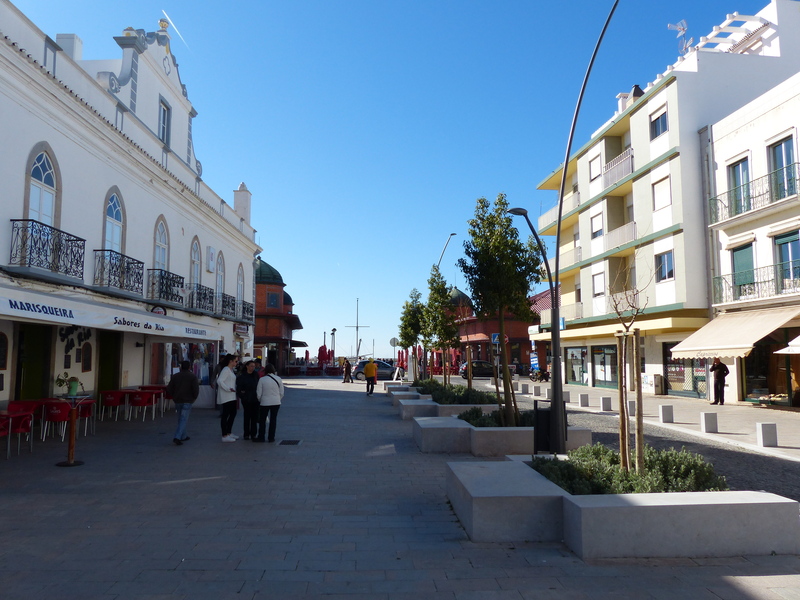 When we left Faro, we stopped at the market to get some bottled water to fill our bike bottles and I went into the supermarket and got two 1.5 litre bottles of water. Guess how much each bottle was? Guess! A 1.5 litre bottle of water was 0.20 euro! That’s about 30 cents! Amazing! After our roam through this lovely little village, we headed back to the tent. I went for a shower, which was just about perfect! Nice clean and modern bathrooms, a shower with consistent hot water, a shower head that I could adjust down to my height, so I didn’t have to put up with water being tepid by the time it got down to me, and the 80’s classic Last Christmas by Wham playing in the background! It was a darn fine shower and I didn’t want to get out! It was time to cook though and Steve had seen that the campsite restaurant had chicken and chips on the menu so he decided he couldn’t knock that back, so he was sorted. I made a delicious vegetable pasta for myself. As I was sitting, precariously balancing a floppy chopping board on my knees to cut my carrots, the German man I’d met earlier walked along the path near our tent, walking the dog. I waved and said hello again. Then, as my pasta was cooking who should come a callin’ but Gerdi, who stopped in to see if everything was OK and we’d settled in. “Heidi!” she called and came up for a chat. So we chatted some more about their time in Tasmania and where they live in Germany and how they spend from October – March each year in Portugal to escape the German winter. She told us their dog is Portuguese. She said a lady that lives near the campsite found it as a pup in a box in a bus shelter so took it home, but she already had five cats and things weren’t working out too well. So she put a photo up at the campsite and Gerdi saw it and said, “That will be my dog!” So they adopted it. She finished by giving us both a hug and kiss on both cheeks and said, “I will see you again! Please, please come to me. You are part of me, you are part of my family, please come. My husband says the same thing. Please, please come. We will see you soon in Germany.” So after a tough day at the office on the road, that was just a completely unexpected but utterly delightful end to the day! We got to meet two lovely people who have now invited us to their home in Germany. Very special. So tomorrow we head for the ferry to cross the water into Spain! A new country. New places to explore. New challenges to face. New people to meet. Fan-tabulous! Hope you have “spare pedals in your paniers” you will be wearing your’s out!!! p.s. Mark wants to know how Steve’s hand is? It was a lovely encounter and yep, those pedals get a workout! Steve’s hand is all fully healed and just waiting for the next little hiccup to happen!